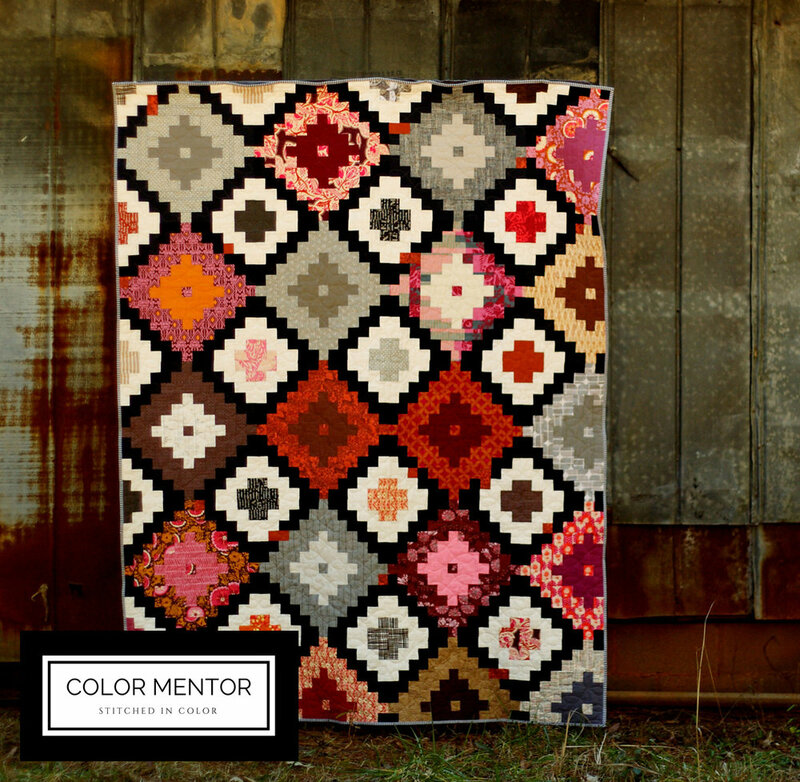 Today I'm excited to present the newest member of my Color Mentor series: Ikat quilt! Originally created in 2014, the new pattern is streamlined, with updated graphic design and a new segment on using color value in patchwork. If you're color curious, this Level 2 Color Mentor pattern is an experience to broaden your horizons. Even though the patchwork looks intricate, it's actually easy to piece with no special seams. Value is a foundational concept for effective fabric choice in patchwork. My first version of Ikat quilt, Rose Chai, relied on high value contrast, resulting in sharp, bold patchwork. While I adore the effect of pairing black and white, I wanted to try something new with my latest iteration. This lovely bouquet (via Pinterest) inspired a softer version. Clementine Ikat Quilt uses medium value contrast and a more selective color scheme. It's all about orange, with a generous sprinkling of neutrals. Also, some peach anomalies and hints of dark, leaf green, both pulled straight from my inspiration image. I love how the colors and contrast turned out. Who knew I could so enjoy orange? It feels soft and sunny and resolutely cheerful. A warm cup and this quilt - I think it'd be a lovely way to start or end the day! 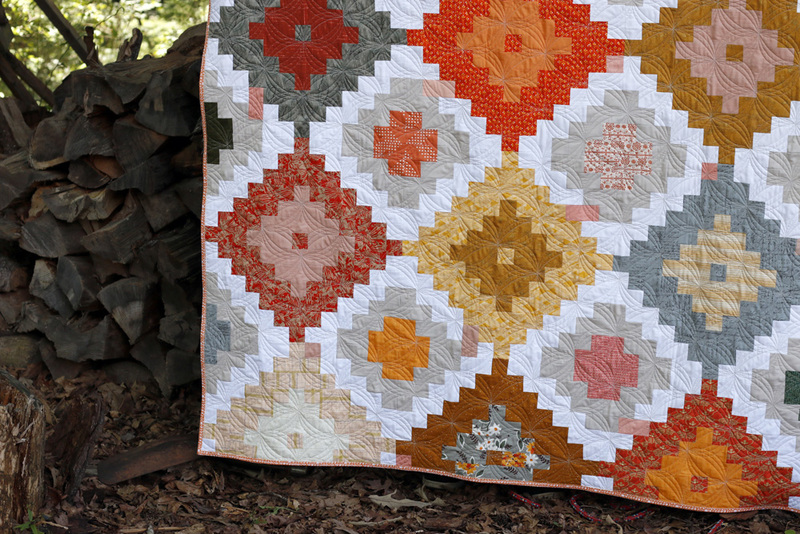 Don't you think the quilting lends an elegant, sweeping texture? Gosh, I love all the choices open to me with longarm quilting! Finishing a quilt never was my favorite part. Nowadays I look forward to seeing how the quilting will elevate my work. With this quilt I wanted something that would reinforce all this piecing with a flourish! Hm... let's see. You can buy the pattern right here, in my pattern shop. Clementine throw quilt is also for sale, over at Handmades. If you already own a copy of Ikat pattern, purchased as a stand-alone pattern in my shop, I'd be happy to send you this updated version. Just drop me a line! The new version does not include machine paper piecing options. Since this quilt can be so straightforwardly machine pieced, I think paper piecing is a waste of time and paper, quite frankly. I've tried it both ways, and I'm sold on the traditional piecing route! I think that's everything, friends. Always a pleasure to share my process and patterns here. Thanks for reading!